Some days, Sundays, I turn on our local NPR afternoon Trail Mix show, which features hour and hour of Celtic , Folk, Bluegrass music. All of it great do some art music. Typically I am all stiff and judgmental of anything I do. So I decided that I would go for what I doodle on my to-do list when I am particularly bored with a phone call usually from charities to which I have already donated. I can fill a page in 15 minutes. 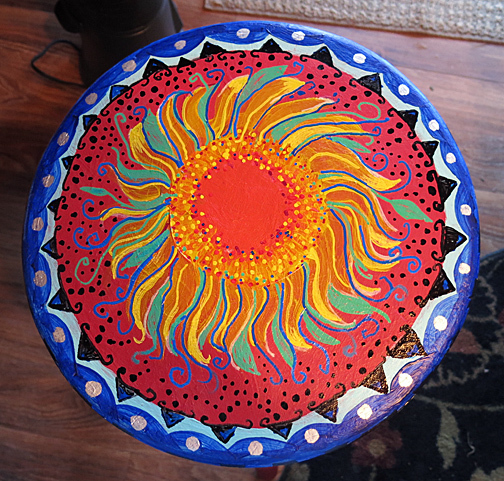 I painted this stool red in August, knowing winter would come and that I'd get back to it with no idea what I was doing. I doodle every day. I think doodles are some sort of insight into what we think, in this case patterns. I so often have a plant and leaves that grows and grows. Or repetitive patterns, tight and overly constrained. I have legs on the stool to complete. I have no idea what goes there. But this is the Doodle stool. Usually I pick up furniture from summer garage sales at less than $10. Stools are usually about $5. I was in Walmart today and the new version of this stool is $15.95 Besides, I like recycling. And working on anything without pre-judgement. If you are daring- send me your doodles.